You will be faced with 2 options; EU or Non-EU. Please do not use mobile phones in this area. Please have your passport open at the photo page ready for scanning. Please note that due to tighter restrictions all passports need to be scanned at the desk, which may take a few minutes. Instead of queuing to go through passport control, you can make your journey easier by using the e-gates – simply follow the instructions at the gate. If your passport has this symbol (see above) on the front cover then you have a biometric passport and are able to use the e-gates. They are available in terminals 1 and 2. You can use these if you are British, from the EEX, Switzerland or Liechtenstein and have a biometric passport. For the latest information on e-Passport facilities available at Manchester Airport, please view our arriving at the airport guide. Upon arrival at Manchester Airport, Passport Control FastTrack allows you access to a dedicated, limited-access queue to Border Force’s passport control checkpoint. Click here to book Passport Control FastTrack*Please note, this service is subject to availability and is not available if you are travelling from Ireland, the United Kingdom, the Isle of Man, or the Channel Islands. View Passport Control Terms and Conditions here. 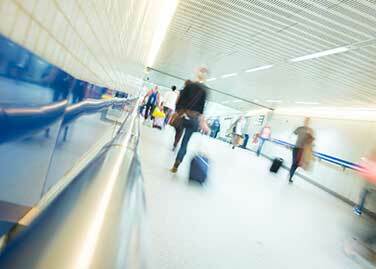 Please be aware that all passengers will be required to pass through Customs and Immigration. Border Force secures the border and promotes national prosperity by facilitating the legitimate movement of individuals and goods, whilst preventing those that would cause harm from entering the UK. After passing through Passport Control, you will enter the Baggage Reclaim hall this is where you will collect your checked-in baggage. Check the information screens to see which carousel you need to go to. Our integrated public transport hub, 'The Station', is a state-of-the art interchange for rail, tram and bus services across the North West and beyond. 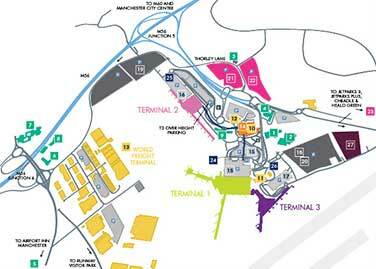 See our handy maps for Manchester Airport for the arrivals area at each terminal, so you can plan out your journey. If you are picking someone up from the airport - see where you can park.